This varied and humorous programme brings alive the cosmopolitan atmosphere of Georgian England, and has strong audience appeal. It features tuneful cantatas and a flute solo by Handel, songs by Pepusch and De Fesch written for the Marylebone Gardens, a harpsichord solo by Dieupart, and a cello sonata by Bononcini. Humorous readings illustrate the transformation of English attitudes to foreigners from suspicion to admiration. In the first part of the programme we evoke all the vigour of Purcell’s London in the late 17th century, with music for strings, solos for recorder and harpsichord, and songs by Locke and Purcell, contrasted with popular songs and dances of the time. After the interval, a cantata by Handel and sonatas for flute and violin by Arne and Stanley, are followed by Arne’s delightful settings of Shakespeare songs. Humorous readings are included too! This exciting concert features J.S. Bach at his most Italianate – with music by real Italians for comparison! The centre-piece is Bach’s wonderful Italian Concerto for solo harpsichord, and we also include one of Bach’s unaccompanied ‘cello suites, and arias with obbligato instruments. We end with part of the well-known Advent cantata Wachet Auf. The Italian pieces include a recorder concerto by Alessandro Scarlatti and the thrilling trio sonata (La Follia) by Vivaldi for two violins and continuo. This fascinating programme evokes the warmth and colour of the high Baroque period from France, Italy and Spain. We include part of Couperin’s famous “La Piémontoise” from Les Nations for flute and violin, a charming cantata by Montéclair, and songs by Carissimi and Marcello. Corelli’s La Follia variations, a ‘cello sonata by Vivaldi and harpsichord sonatas by Domenico Scarlatti complete the programme. A very popular programme, this time focussing on the music of Handel beginning with the Overture to Messiah, and including the ‘Pastoral Symphony’, individual arias, German carols and a medley of Christmas dances. Audience participation if you wish too. This varied and humorous programme brings alive the cosmopolitan atmosphere of Georgian England, and has strong audience appeal. It features tuneful cantatas and a flute solo by Handel, songs by Pepusch and De Fesch written for the Marylebone Gardens, a harpsichord solo by Dieupart, and a cello sonata by Bononcini. Readings illustrate the transformation of English attitudes to foreigners from suspicion to admiration. A programme of pieces by J.S. Bach at his most Italianate – with music by real Italians for comparison. The centre-piece is Bach’s wonderful Italian Concerto for solo harpsichord, and we also include one of Bach’s unaccompanied ‘cello suites, and arias with obbligato instruments. We end with part of the well-known Advent cantata Wachet Auf. The Italian pieces include a recorder concerto by Alessandro Scarlatti and the exciting trio sonata (La Follia) by Vivaldi for two violins and continuo. John Playford’s dance tune provides the title for this celebration of the pastoral, including a surprise new composition based on the tune, ‘All in a Garden Green’. Delightful English songs of the 17th century include works by Lanier and Lawes, as well as ‘Sweeter than Roses’, and the ‘Masque of the Seasons’ from The Fairy Queen, by Purcell. We also perform the marvellous cantata Le Berger by Montéclair, tunes from The Bird Fancyer’s Delight played on a golden sopranino recorder, and a Paris quartet by Telemann. A programme of music and readings for autumn inspired by falling leaves, haymaking and Halloween ! This programme includes an exciting trio sonata for violins by Vivaldi, the Masque of the Seasons from Purcell’s Fairy Queen and a lively recorder sonata by Telemann. In this concert we capture the spirit of a concert given at Zimmermann’s coffee house in Bach’s own day. Join us for music by Georg Philip Telemann, George Frideric Handel, Nicolas Bernier and J.S. Bach himself – with coffee and cakes of course. This fascinating programme evokes the warmth and colour of the high Baroque period from France, Italy and Spain. It includes part of Couperin’s famous ‘La Piémontoise’ from Les Nations for flute and violin, a charming cantata by Montéclair, and songs by Carissimi and Marcello. Corelli’s La Follia variations, a ‘cello sonata by Vivaldi and harpsichord sonatas by Domenico Scarlatti complete the programme. This programme is inspired by the eight-year old Mozart’s five-month stay in London. We include the set of harpsichord pieces from his ‘London notebook’, and works by other foreign visitors – Giardini, Galuppi, and the already famous J.C. Bach. These are contrasted with delightful pieces by native English composers – Thomas Arne, Thomas Chilcot and William Shield. The concert ends with a version of Mozart’s charming aria ‘Va, dal furor portat’ for tenor and orchestra written during this visit. 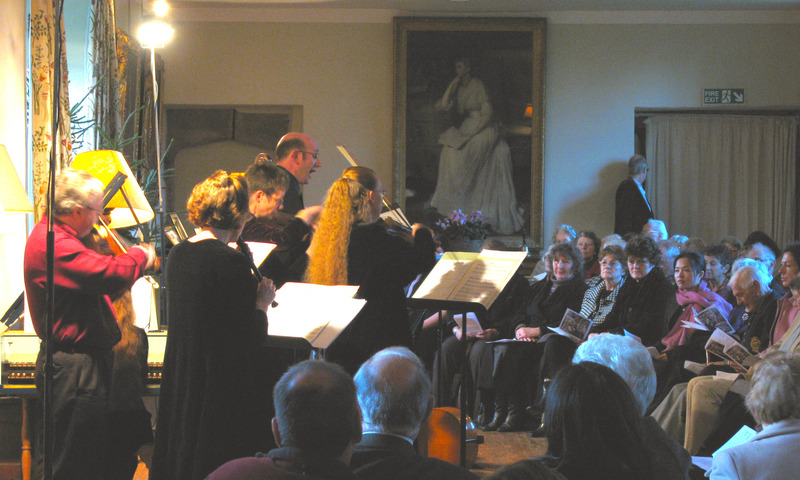 A very popular programme including baroque concertos, such as ‘Winter’ from Vivaldi’s The Four Seasons or Corelli’s Christmas Concerto, mediaeval carols, and original versions of well-known Christmas carols. Promoters may wish to offer mulled wine and mince pies, and to hold the concert by candlelight. Here is something really different: a programme exploring Shakespeare’s use of music and musical imagery. We include settings of lyrics from the plays, and instrumental pieces, including music by Robert Johnson, Locke, Purcell, Arne and Dibdin. Speeches and dialogue from the plays place the music in its dramatic context – serious, lyrical and comic by turns – to produce a continuous, fast-paced, exciting entertainment. In addition to its work as a chamber ensemble, Musica Donum Dei has enjoyed working regularly with various choral groups since its foundation. We can provide a full-size baroque or classical orchestra for performances of the choral repertoire which fall within the period 1600 – 1800. We take great care to match editions, and to follow the requirements of any given choir and its conductor. We are prepared to make suggestions concerning the layout of the choir, phrasing, articulation and balance. We will also give estimates for different sizes of orchestra, and to make suggestions about what is possible and what is desirable, in terms of the numbers of string players in relation to the number of singers for instance. We will also add on the hire of a chamber organ if required. MDD has worked with choral societies such as Derby Bach Choir, Leicester Chorale, Ruddington Choral Society (Nottingham) the UK-Japan Choir, the North Herts Guild of Singers and the Barnet Choral Society. Performances in recent years have included Mozart’s Requiem with Derby Bach Choir, Monteverdi’s Vespers with Renaissance Voices (Maidenhead), Handel’s Israel in Egypt with Barnet Choral Society, Haydn’s Stabat Mater with Royal Leamington Spa Bach Choir, JS Bach’s St John Passion with the Leicester Bach Choir, the Choir of Waltham Abbey and the Choir of St Mary’s Nottingham. We have also performed JS Bach’s St Matthew Passion with the Choir of St Mary’s Nottingham. If you would like to discuss a collaboration between your choir and MDD, please call our Orchestral Manager, Diane Terry, on 01727 843656. For more information about booking Musica Donum Dei please use the contact form below.